Student Cierra Valentine (left) studies with friends and her son Jeremiah on the lawn at Wilson College in Chambersburg, Pa.
Michele Rogers (left) and Heather Schuler are students — and single moms — at Wilson College in Chambersburg, Pa.
Brinita Ricks, a graduate of the single-parents program, and her son, Troy, 10. The young women in this story have labels. Three labels: Single, mother, college student. They're raising a child and getting an education — three of the 2.6 million unmarried parents attending U.S. colleges and universities. Getting a degree is hard enough for anyone, but these students face extra challenges. And when it comes to helping out with their needs, Wilson College in Chambersburg, Pa., is considered one of the best in the country. It's a liberal arts school with 1,100 students. There's a large farm, an equestrian program, and 15 students in the Single Parent Scholars program. This year all are moms, though men are welcome too. They live in apartments that once were dorm rooms. And they are easy to notice on campus. "We have children running around the dining hall while everyone else is trying to eat," says Heather Schuler. She's 25, a sophomore psychology major and the mother of a 2-year-old son. Schuler is sitting outside the dining hall with her friend Michelle Rogers, who has a 4-year-old daughter. Rogers, 27, a senior environmental studies major, says being a parent and a student requires some adjustments. "I still sometimes have my mommy voice on," she says. "I don't even swear anymore. I'll say like, 'Sugar honey ice tea!' or, like, 'Shut the front door!' "
Heather Schuler laughs. She does it too. "I almost confronted someone at Target the other day for swearing, and my kid wasn't even with me!" Schuler grew up right here in Chambersburg. Michele Rogers is from Massachusetts. She'd been searching for a program to help single parents when she discovered Wilson. "I Googled, 'schools for single parents,' mostly single moms. And I found maybe like five or ten." A lot of colleges and universities are taking interest in serving these students. Eastern Kentucky University is building a $10 million apartment complex for single moms, and dads. At Wilson College, says Rogers, having a dorm building all to themselves is wonderful. "It's a cool community where you're not you're not always on top of each other and always around each other," she says. "You can always go in your room and the kids get to play together, which is awesome." The Single Parent Scholars program began 20 years ago as a wishful notion in the mind of Gwendolyn Jensen, who was Wilson College's then-president. She was looking out a window in her office one day, admiring a limestone dormitory building that had been shut down due to low enrollment. And she thought, Why not fill that up with moms and kids? She drove to Pittsburgh to visit the Eden Hall Foundation. There, she talked with Sylvia Fields, who now is the executive director. Fields thought it was a great idea: "Don't tell me any more," she said. "How much do you need?" "I was really afraid when we started the program," recalls Jensen, who's now retired and lives in Cambridge, Mass. "We had this idea and all of a sudden we had $400,000." Jensen spent much of that money rebuilding. The empty dorm would now have two-room apartments. Private bathrooms. Kitchens to share on each floor. The Wilson student mothers live right in the center of campus, with classes just minutes away and the dining room close by. Katie Kough is in charge of the single scholar program. On a tour, she shows off one of the laundry rooms, with coinless machines, and a poster with the guidelines. The bottom floor of the dorm has been given over to child care, with lots of windows and a playground outside. Students in the program pay the full tuition, room and board. Of course many apply for and receive loans and scholarships. But the big thing for these single parents — and it's a huge one, adds Katie Kough — is child care. "The child care costs are nothing," she says. Child care in the morning and throughout the day. Evening hours, too. On a recent fall weekend, there was a 20th reunion for students who've gone through the program. Katie Kough introduces me to Brinita Ricks – Katie calls her "an alumni superstar." Ricks started the program in 2008 and graduated four years later. Now she lives in Washington, D.C., where she's a computer scientist with the U.S. Census Bureau. 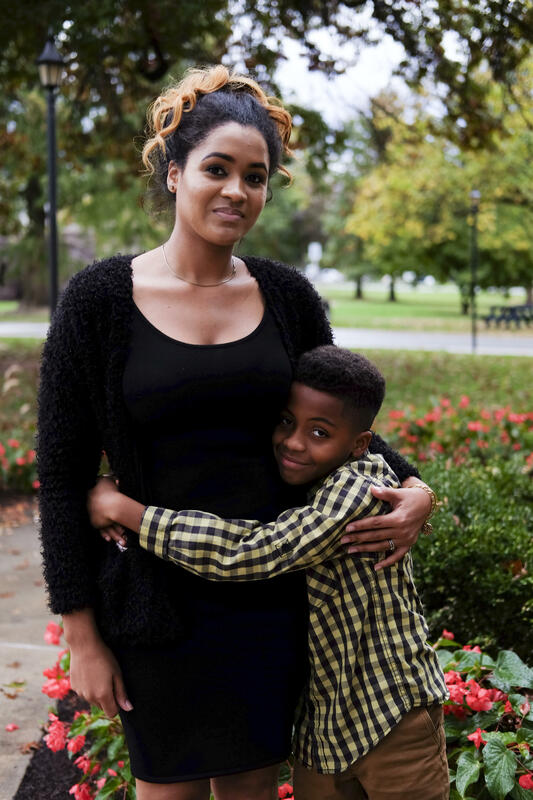 She's brought her 10-year-old son back with her to campus. "We just took him on a tour down at the daycare," she says. "And he remembered. He started in the baby class and moved on up to the big kids class." Katie Kough, once Ricks' advisor, is now a friend. 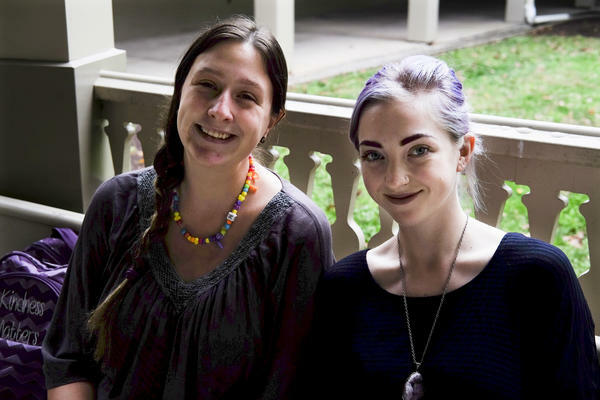 "There are some women who have graduated from this program that probably no one ever thought that they would be a college student," she says. "A college graduate student, or a professional, and they did it. " Kough says that in her eight years running this program, 38 students have made it through with a degree. I tell these women when they start it's going to be difficult, she says. "That the Devil's gonna tap their shoulders three times a day and tell them to go home." She adds: "It wasn't always pretty, and it wasn't always easy. But some of these women are the strongest, strongest women that I know." ADAMS: Noah Adams, NPR News. Transcript provided by NPR, Copyright NPR.